The Explorers Club movie is a short animated adventure film that takes audiences on a thrilling, action packed ride through the giant screen universe. The film is youth oriented and is intended to increase audience awareness of the difference between conventional and giant screen cinemas. The five-minute film opens in a theater ticket line were a group of animated Explorers are purchasing their movie passes. As they take their seats our main character, TRIP, quickly realizes that he is about to be initiated into the Explorers Club. Our hero is sucked into the giant screen and whisked away on a wildly adventurous journey. Younger audience members will really feel the excitement as our hero escapes from shark infested waters, streaks across space, barely avoids voracious raptors and survives a hair raising ride on the tail of a careening Indy car! TRIP finally bounces back into his seat where he is awarded an Explorers Club Member badge. The movie is a metaphor for the large format experience. Like all large screen audience members, our hero is drawn into the film world to discover and explore nature and the seas, space and technology. 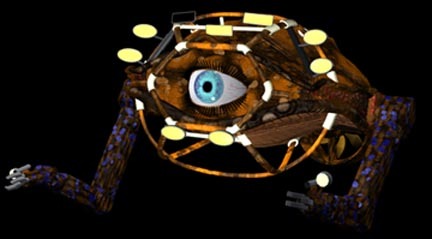 DivX codec for Windows(5.1MB) and Windows Media Player. 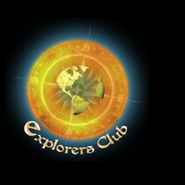 Click on the icon to go to the Explorers Club website.